Fisher Price has announced the newest addition to their Power Wheels lineup with their new 2014 Chevrolet Corvette Stingray and when the C7 Corvette for kids goes on sale later this year, it will be the fastest Power Wheels model available – although it is still a bit slower than the SRT Viper for kids. The 2014 Chevrolet Corvette Stingray Power Wheels is styled from front to back to accurately match the full sized production version of the C7 Corvette that is slated to hit dealerships later this year. From the sharp, angular headlights to the chrome wheels to the squared back end with the controversial rectangular taillights – the Power Wheels C7 Corvette offers everything that the real car does only in smaller stature. Two major exceptions is that the Power Wheels Corvette Stingray only seats one person and, of course, the Power Wheels C7 is powered by an electric motor rather than the 460 horsepower V8. However, in place of the big V8 drivetrain is a high powered electric drive motor that makes this Power Wheels the fastest ever. The 2014 Chevrolet Corvette Stingray from Power Wheels relies on a 12 volt battery to get it moving with 2 forward speeds and reverse. In the low gear, the Power Wheels Corvette will hit 3 miles per hour and when your kid shifts into high gear, the plastic and electric C7 will hit a top speed of 6 miles per hour. All other current Power Wheels models, including the Boss 302, are limited to a top speed of 5 miles per hour in high gear and 2.5 miles per hour in low gear. The one downside to the Power Wheels C7 Corvette is that it is only capable of carrying 65 pounds as opposed to the 130 pound limit of the Mustang Boss 302 and the Cadillac Escalade. However, with room for only one child the 65lb weight limit really shouldn’t be too much of an issue. The bad news is that the Power Wheels 2014 Corvette Stingray will not be available until November so little gearheads with a birthday in the next few months will have to settle for another model or take an I-O-U until later this year. When it does hit shelves around the country, Fisher Price expects to charge somewhere in the area of $275 – making it quite a bit less expensive than the Power Wheels Mustang Boss 302 that carries an MSRP of $345. 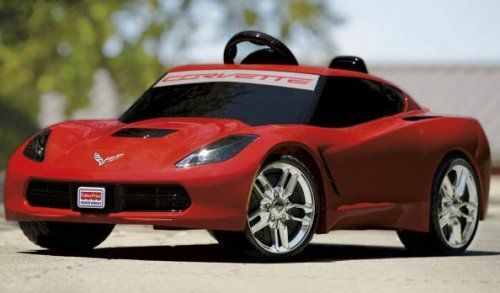 While it is impressive for the 2014 Corvette Stingray to be the fastest Power Wheels option in the Fisher Price lineup, this new children’s Corvette is not the fastest kid’s car on the market. That claim goes to the Kid Trax 2013 SRT Viper GTS, which calls upon a 16 volt electric drivetrain to hit speeds reaching 7 to 8 miles per hour. The Kid Trax Viper also offers 2 seats, a weight capacity of 130lbs, an FM radio with MP3 connection, high grip tires and LED headlights for the ultimate plastic supercar driving experience. At the same time, the extra power, extra speed and unique features of the Viper come with a slightly higher MSRP of $319.